Medical sources said, Sunday, that Riham al-Dawabsha, mother of a Palestinian 18-month-old toddler who was killed in an terrorist attack carried out by Israeli settlers in July, was beginning to ‘respond’ to medical treatment, although she remained in critical danger.Medical sources at Tel HaShomer Hospital told Ma’an that Riham, 27, who suffered third degree burns to 90 percent of her body in the attack, was beginning to respond to antibiotics. The Palestinian Authority Ministry of Health, however, said that she remained in a very serious conditions due to both bacterial and fungal infections. Riham’s health was showing signs of deterioration on Saturday, according to Al Ray. Kamal al-Shakhra, the head of a medical team sent to Tel HaShomer hospital by the PA earlier Sunday, said in a press statement that Riham’s blood pressure had dropped and her vital organs had stopped working, but that her condition was stable. Al-Shakhra said that doctors at the hospital were planning for Riham to undergo a skin transplant operation, although the operation has been postponed until her health shows signs of improvement. Al-Shakhra confirmed that the condition of Riham’s four-year-old son, Ahmad, was getting better. Eyhab al-Zeitawi, from the PA Ministry for Civil Affairs, said that following directives from Minister for Civil Affairs Hussien al-Shiekh, action had been taken for the the Dawabsha family to visit Riham and Ahmad. 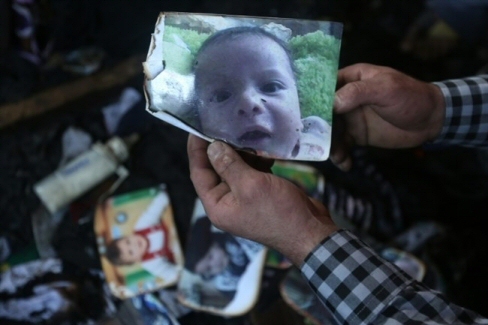 Ahmad, was also severely burnt in the attack on the family’s home on July 31 that killed his 18-month-old brother, Ali, and a little over a week later his father, Saad, 30, who succumbed to his wounds in Soroka Hospital in southern Israel. The attack sparked international outrage, although many Palestinians pointed out that settler attacks against the Palestinian community are common and often go unpunished by the Israeli authorities. Following the attack, Israeli authorities arrested a number of extremist settlers without charge, but later released nearly all the suspects.